The app has given news brands a dramatic and much-needed online boost, Gideon Spanier writes. News brands are desperately seeking ways to make money from online news as automated trading and a surplus of ad inventory push down on prices, so some publishers have been cheered by the growth in traffic they are seeing from Apple News. The big driver of growth has been Apple’s decision to pre-install the mobile service on iPhones and iPads. Jim Freeman, commercial director of sales and trading at Telegraph Media Group, said its page views on Apple News have jumped fivefold in the last three months and are now bigger than Google or Facebook. TMG has a commercial reason to champion Apple News because it has just signed a deal to be its exclusive ad sales partner for Apple-owned inventory on Apple News in the UK – primarily on the "For You" section, a personalised feed of news, based on a user’s habits and interests, from 4,000 approved publishers. That goes some way to avoiding the rise of so-called "fake news". Other news brands also report strong growth. Nick Hewat, commercial director at Guardian News & Media, says it is seeing "significant increases" in traffic from Apple News, although he is doubtful that it could rival Google or Facebook. Several other news publishers that are active on Apple News are bullish privately but declined to comment, perhaps because they didn’t want to upset Google or Facebook. Apple wants to support Apple News, thinking that users of its mobile products value news, even though it will not be a big revenue driver for the iPhone giant. Apple News is understood to have a small editorial team but most of the content is curated by algorithm. The attraction for advertisers is that ads on Apple News "fit in the environment beautifully", are "four times the resolution" of typical mobile ads and cannot be blocked, according to Freeman. Sarah Treliving, managing partner, digital, at MediaCom, says Apple’s high market share with its iOS operating system that is roughly on a par with Google’s Android "likely puts Apple in pole position". The company’s "ruthless consumer-first approach" is also helping to win readers, she believes. TMG likes Apple News because it allows The Daily Telegraph to put paywalled content from its new Telegraph Premium service for comment and analysis on the mobile service and ensure users pay for it – unlike on other big third-party platforms. Some publishers remain wary about Apple News. It is understood that the Financial Times experimented with the service but decided to pull out. A spokesman declined to comment. "Apple News is bigger than the other two third-party platforms in terms of page views, which have increased fivefold in three months for us. Apple seems to have stolen a march on some of the others with the growth we’ve seen." 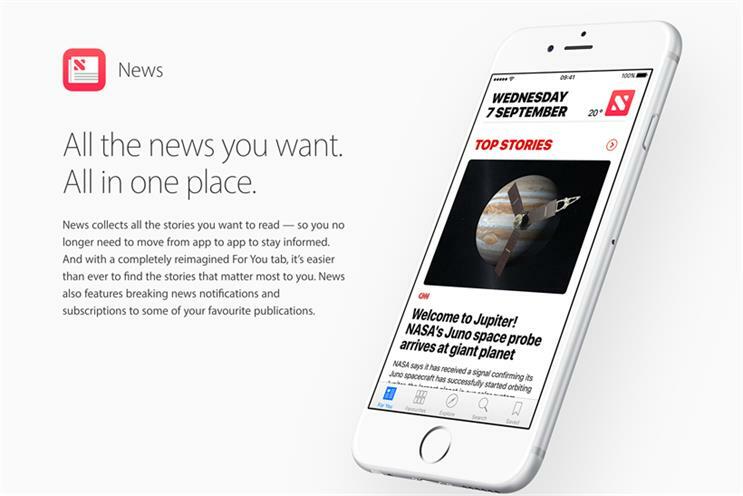 "Apple’s user journey means that news is front and centre, one swipe required. Revenue will most likely follow. Apple’s brand acts as a filter for the curation of news, perhaps more so than Google and Facebook." "It’s hard to see Apple competing in terms of the sheer scale and traffic generation of the other two. The opportunity could come from clearer monetisation models and the ability to build greater brand loyalty with readers coming to us through Apple News." "I have loads of respect for Apple and what they’re doing with the Telegraph. But for advertisers, it’s very difficult because Apple has been a stop-start operation commercially."